Civilization has grown and grown over the years, uniting to create New Babylon, a bastion of mankind. But of course, a city this large is full of secrets. Even as modern advancements came and went, science simply could never rid the world of that most ancient of past times: religion. New Babylon is a city as fractured as a jigsaw puzzle, filled with powerful people constantly hoping to change it into what it should be. It has made it a city where a corner turned leads you down an old church street or a modern sidewalk depending on where you want to go. And unknown to many of its people, it's a battleground. So many souls, so many clashes of ideas and beliefs, it's like a magnet pulling some of the most ancient forces to it. There are some who wish it to be the ultimate Utopia. Who wish to lead man away from their baser urges or raise them up to a new spiritual awakening, or teach them true enlightenment. Many people have seen Karine. She's the pale figure with a shining sword who wreaks bloody havoc on anyone she deems worthy of receiving it. No one knows if she's a devil or a saint, nor do they fully understand the god she serves. She's an enigma many are afraid to approach as she's just as likely to kill you as to speak to you, but many also dare because she's one of the easiest ways to get to Adrian. Now he is never seen on the streets, despite the whispers about him. The path to him is a secret one but so many are willing to struggle to find it, the desperate and the crazy, because in his hands, blood is clay. He is a maker of monsters and the re-shaper of flesh, should you be willing to lay your life in his hands. He can craft you into an entirely new being with the help of the secret god he serves. Despite the fact they both serve the same entity, they are rarely seen in each other's company. And even fewer come to realize that they are both simply avatars, different forms of the same entity, two people enslaved and changed long ago by that mysterious entity known simply as Bates. Few have seen his true form, to most he is simply a whisper in your dreams, drawing you into the heart of the streets, a gentle voice that calls out to the lost...and the damned. They marched, two by two formation, down the dark streets of the city. Of all the strange uprising of new cults and religions that had cropped up in New Babylon lately, the Sisterhood was one of the most violent. According to them, it wasn't murder if it was done in the name of God, and so they felt no qualms about killing off many of the heathens that were showing up more and more often. They searched now, armed with daggers dipped in holy water, chanting praises as they moved along, the moonlight shining off their white robes. 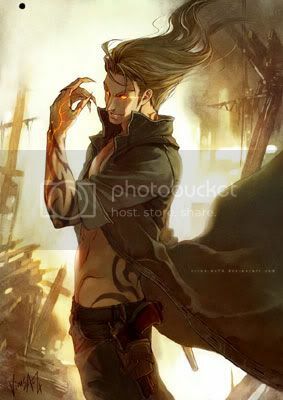 Orpheus was born in the flames of hell’s fire, embodied in a persona that looks much like a human. A perfect spectre of humanity: strong and heart achingly beautiful. Markings swirl around his body, mistaken by most as dark tattoos. But they are far from superficial, charred on his body by hellfire by demonic forces. His amber eyes are flecked with gold, and flicker just so in the darkness of midnight. The child of darkness walks among mortals within the city of New Babylon. Only to demons and gods does he consider his equality, humans are nothing to him, a means to an end. Dark rituals provide a touch of amusement to his existence. When it suits him he provides protection to those of a darker order: mortals full of vanity, lust, greed and those that kill, those that worship the darkness and the fires of hell. He chuckles in amusement as the Sisterhood passes him by on the street. Those daggers dipped in holy water would do nothing to him, blessed by their priests. They were silly, fragile creatures whose bones he could crush with his bare hands. They could burn with the fire running through his veins with a simple caress. He could glamour them into a stupor. Unfortunately for them, Karine also had no qualms about slaughtering heathens...and her idea of what a heathen was varied quite a bit from theirs. The leader halted her sisters and pointed to something that appeared to have been human once disappearing into an alley ahead of them. A cold smile curved her lips and she guided them in that direction. The sisters in the back died as so many others did, only aware of the pale figure coming at them at the very last moment. They didn't even have time to scream before they fell to the ground, blood spurting over the concrete. A cry of alarm went through the formation and they all turned to meet the woman standing calmly in the middle of the street, surrounded by the bodies of their dead sisters. Orpheus breathed in deeply as the scent of blood wafted to him downwind. He closed his eyes and smiled a little to himself. He assumed by the strength of the scent that the Sisterhood had met with an unlucky end. Orpheus turned and started down the sidewalk that would turn into the alleyway. The murderer, or murderess may have fled by that moment, but he would take a glance as it was, if only to see the Sisterhood lining the streets. That, would give him a small sense of satisfaction, the predatory look that had been in the white robed faces would now be forever twisted in a grimace of death. Oh, how he loved it. The murderess had not fled, at least not yet. When Orpheus arrived, the last of the Sisterhood's formation was dying, bleeding from a dozen wounds as she stumbled toward the demon blindly. As Orpheus saw the woman’s feeble efforts to hold on to her life, stumbling towards him as if he was her savior, he laughed lightly in amusement. He took a few steps forward to close the gap between them and put his hand around the back of her head, pulling her to his chest. He ran a hand over her hair lightly and spoke in soothing words. “Don’t worry, it will all be over soon.” Orpheus sighed and ran a hand along the pale woman’s cheek. “Humans, so fragile. So vulnerable.” The woman whimpered, her eyes wide and frightened, as she tried to pull away from his embrace. This was no savior, this was the enemy. “Demon,” she spat at him weakly and coughed up blood. His smile grew wide as he roughly denied the Sister her escape. “I’ll see you in hell,” he whispered, closing his eyes as the woman died in his arms, her eyes rolling back as she slumped against him. The killer stood amongst the bodies of the others, watching him silently with cool gray eyes. She wasn't human, that much was obvious, but what she was, exactly, was rather unclear. 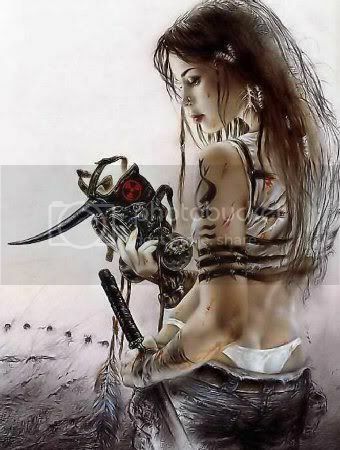 She sheathed her sword as the last woman died in his hold, watching without a twitch or expression. Orpheus chuckled again as he let the woman drop to the ground unceremoniously and wiped the blood on his hands against his black shirt. He lifted his eyes to the woman standing among the bodies and smiled a little at her. Had this been simply an act of extermination or had it been a touch more personal? He wouldn’t know unless he asked, but by the look on her face he didn’t feel inclined. Orpheus looked down among the bodies. From the look of things they hadn’t managed to put up much of a struggle. “Like lambs to the slaughter,” he said quietly to himself. He wondered what place of worship these mislead women had called their own, what sort of religion they had clung to? He chuckled again, wondering if anyone was even left alive. An empty church, now that was something to smile about. "You are a new one. I've not seen you around here before." The killer finally spoke, her smoky voice drifting on the air. “I wander from place to place,” he replied vaguely. "Don't we all." She stepped delicately over the bodies, moving past him and down the street, toward the alley the Sisterhood had been aiming for. She paused and looked over her shoulder at him, blinking in surprise. "No...I can't say the same for some of the others, though..." She turned to study him with a bit more interest. "You're the first one to even ask such a thing...the others don't care."